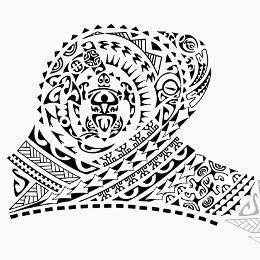 We used a few motifs from Samoa for the armband of this half sleeve requested by Domiziano, as well as the Samoan idea of having the designs follow and enhance the lines of the muscles. The main theme is about the warrior, the fighter, his main characteristics being strength, determination, valiance, tenacity. Protected in the middle of his life, the turtle symbolizes here his family. 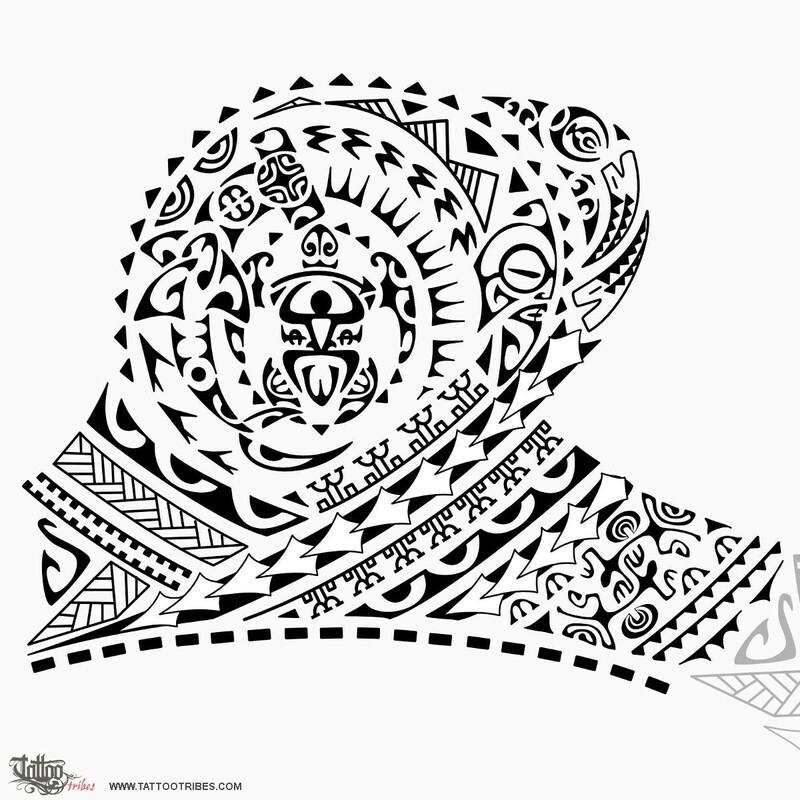 The turtle shell is made of a double warrior guarding on it: the visible one, in Hawaiian style, holding a spear above his head, was stylized and shaped to become the face of a warrior with his tongue stretched out, Maori-like. The turtle is surrounded and protected by a hammerhead shark (determination, protection) on the left, and by a sun (joy, positivity, success) on the right, this one being shaped by mountains(stability). Another sun on the outside enhances these characteristics, and the shark teeth that build it up are for adaptability and protection. A Marquesan cross inside the head of the hammerhead shark was placed for balance and harmony; inside its body and on its side, hands and eyes of a tiki protect from that direction,whilst a tiki on the other side, pointing towards the back of the shoulder (which also refers to the past) keeps two moray eels at bay, one of which pointing upwards and the other one downwards to symbolize the spiritual and physical challenges faced and defeated in the past. The round element on top is the all-seeing eye, guarding the back from enemies. Birds and fish in this tattoo symbolize freedom, help and prosperity. One row of spear heads in the armband has two similar rows of elements along its sides, mirrored to each other. Spear heads symbolize the warrior and the near elements are two rows of men: the ones below, turned upside down, represent the adversaries defeated by Domiziano (together with difficulties and negative changes representsd by the waves going down), kept far and at bay. above, the standing people represent true friends (fewer but bigger) who are closer to him, inside his inner circle, along with the waves going upwards symbolizing positive changes. A second row of spear heads going to the right in the design cuts the enemies out and keeps them isolated. Two lizards for good luck with ipu signs for fertility and wealth come after them; shark teeth again are for protection and the fish hook stands for prosperity and status. Braids symbolize union and the row of stones on the bottom represents the goals earned day by day on which Domiziano built what he is now.